After having mentioned for quite some time about how I am doing a fork swap, here is some progress. I'll try not to post too many generic pics of forks, triple clamps and other bike ****, rather concentrate on the fiddly bits. The close ups as it were, with details and measurements as I go. Disclaimer: this stuff is what works for me . Some of it may not work the first time and have to be done again . Didn't do my research properly, and bought the 07 and an 05 lower... which aren't compatible, due to the 05/06 having a 32.5mm offset and the 07-13 having a 30mm offset. I had to buy a complete '12 set off ebay. I'm using the '07 upper. Its much nicer finished than the '12 one. I had to have it bored out from 48mm to 50mm to fit the tops of the forks. Stem is the standard Honda one, same as the VTR, same size bearings. I'm using All ***** tapered rollers. Forks and calipers: ZX10r, 04/05, Tokico calipers off same. Length cap to axle 730mm, 54mm dia lower mount point, 50mm upper mount point. 20mm axle, same as firestorm, a big reason I chose it. The brakes on these things were infamously bad, traceable to the mastercylinder. Put a Nissin or Brembo on and they were as good as anything else in class. I will have braided lines. Clipons: Bought off trademe, these are adjustable high rise clipons and should put me about where the stock firestorm ones are. I am having them turned down to the same length as the Firestorm ones are, and bored (Solid alloy bar) to allow for mounting red ZETA bar end caps. Wheels and disks:Stock VTR1000f for now, later I'll go to late model GSXR600 wheels and 310mm disks. So after receiving the top triple back from the machine shop, I bolted them in and slid the forks in. Lovely, but very little lock. Put the VTR wheel in and calipers on. Close, very close. The ZX10r has disk spacing of 143mm centres. Fork spacing of 215mm. CBR600rr has a fork spacing of 204mm. 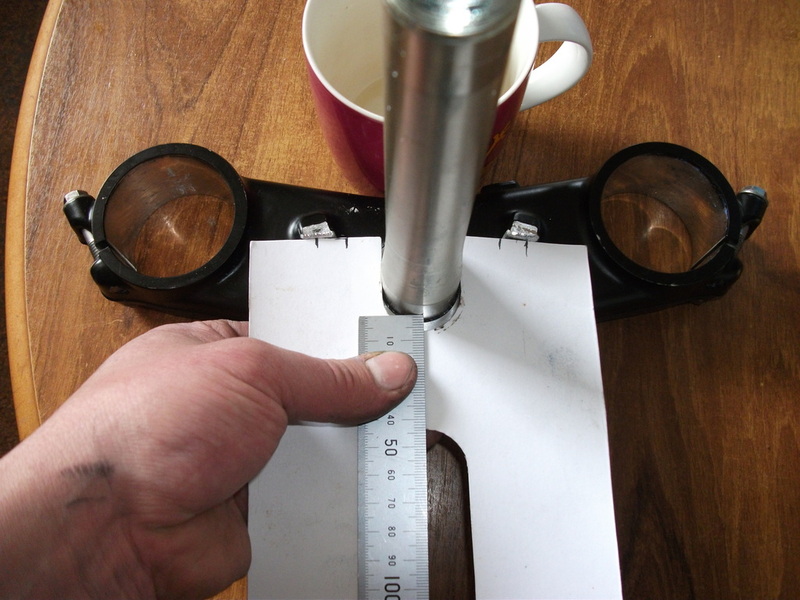 Meaning that the caliper spacing is moved in 11mm and is now 132mm. 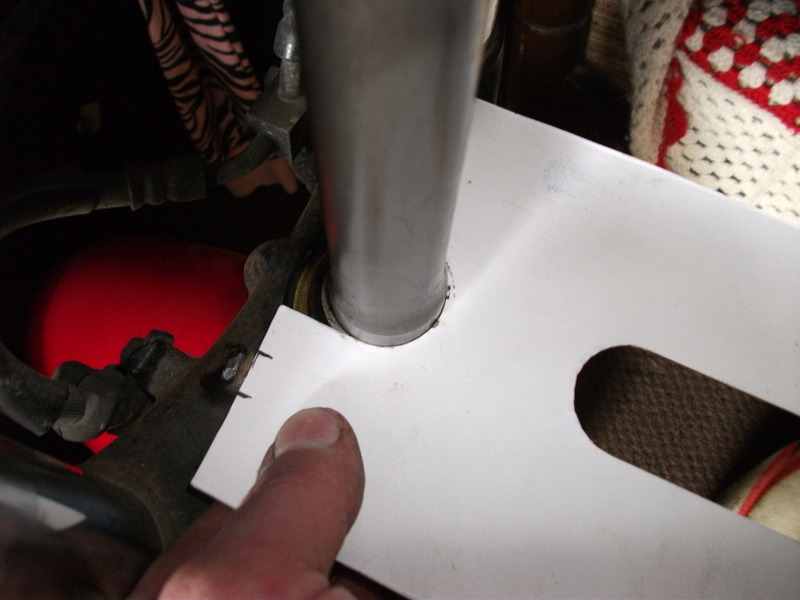 To set the steering lock I built a template out of card based on the original lower triple. 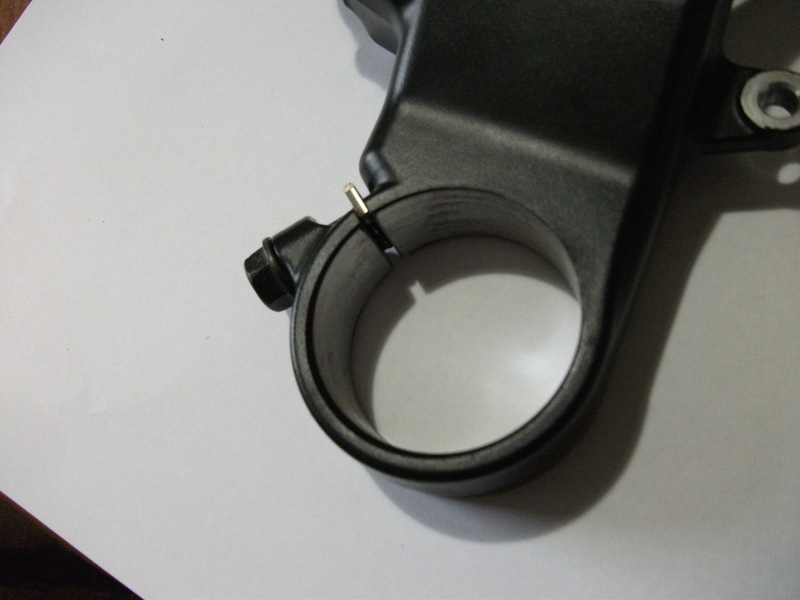 It also changed the angle at the front face of the stops to one better suited to the Firestorm frame stops. Measuring CBR600rr triple. Shown here at first test. I had to take another mm off before it had the lock I wanted, so the gap between the spindle and the card should be around 5-5.5mm. 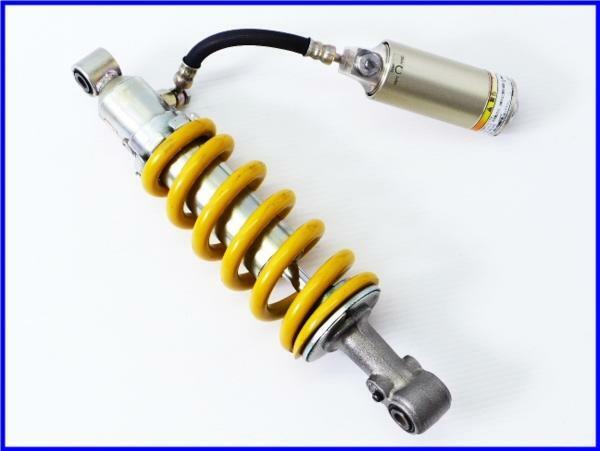 Oh BTW, heres the shock I'm putting on. Its a fully adjustable OEM fitment reservoir shock, I believe only sold on the Japanese market. I am having 2mm taken off the mounting faces of the calipers, to reduce the working diameter from the Kawasaki's 300mm to Honda's 296mm. been down this road already (two years ago); your wheel spacer measurements match mine exactly. BTW, if you want to go to a different wheel with 310mm rotor, use a 600RR wheel (same year as triples) and, again, you are a set of wheel spacers (and caliper spacers) away from a perfect fit (both use 20mm axle). Last edited by mikstr; 10-03-2015 at 07:51 AM. More info about the rear shock please. FWIW, you can have any decent suspension shop fit a reservoir to a stock VTR shock. 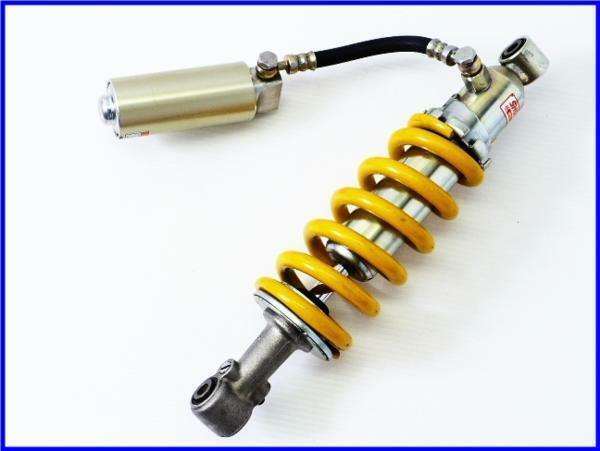 I had a friend of mine do it (reservoir from snowmobile racing shock) and had a shock with high and low-speed compression adjustment (eventually sold it when an Ohlins came on the market for a decent price). Last edited by mikstr; 10-03-2015 at 09:01 AM. This is very interesting to read. Keep us posted please. Also good to see you have some nice advice from others!! So it sounds like you could have a set of 30mm offset triples, amd a set of 32.5mm offset triples... That's pretty awesome in that it would allow more suspension tuning, and those parts aren't too pricey! Can i ask you guys a question about boring the top triple out to 50mm? Is that done with the triple full closed (bolts all the way seated), or fully open (no bolts installed), or something else??? I had my upper triple done by Jamie Daugherty, so perhaps ask him. I put the triple clamp around a piece of steel that I just happened to have that was 48mm diameter, and measured the gap that the bolt tightens with my vernier calipers. From memory, right on the 2mm mark for mine. 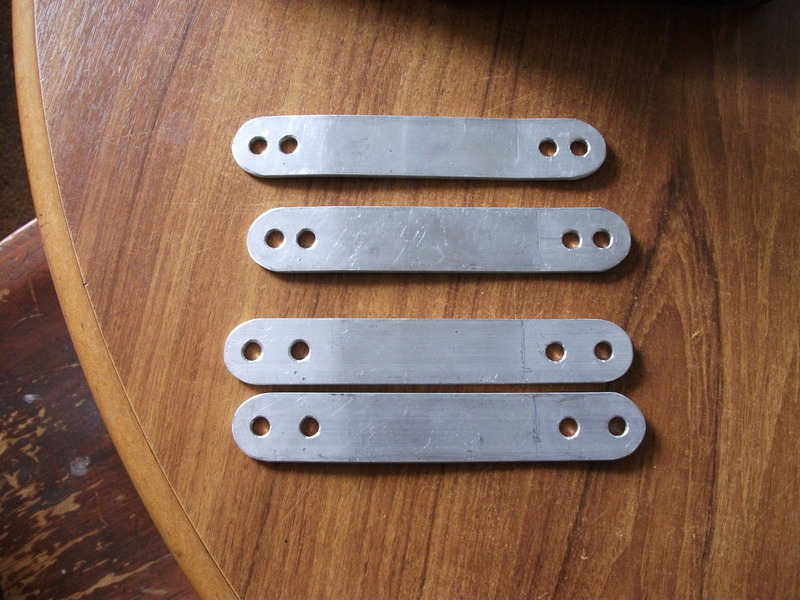 Then I built some slotted packers the right thickness that didn't protrude into where it was going to be machined and tightened the bolts up with the packers in place, and checked for round with the verniers. It was about 0.2mm out of round. I couldn't think how to make it any better. I'd suggest putting the triple around an actual fork. Not too many of us just have these random pieces of metal lying around... I'm an engineer, light fabrication by trade, and I tend to collect interesting bits of scrap to use as dolleys to hammer things over. Re the shock, I got it off Yahoo Japan auctions. They show up on there from time to time. They were an OEM option. Don't know much more than that. More pics tonight when I actually get on my computer. 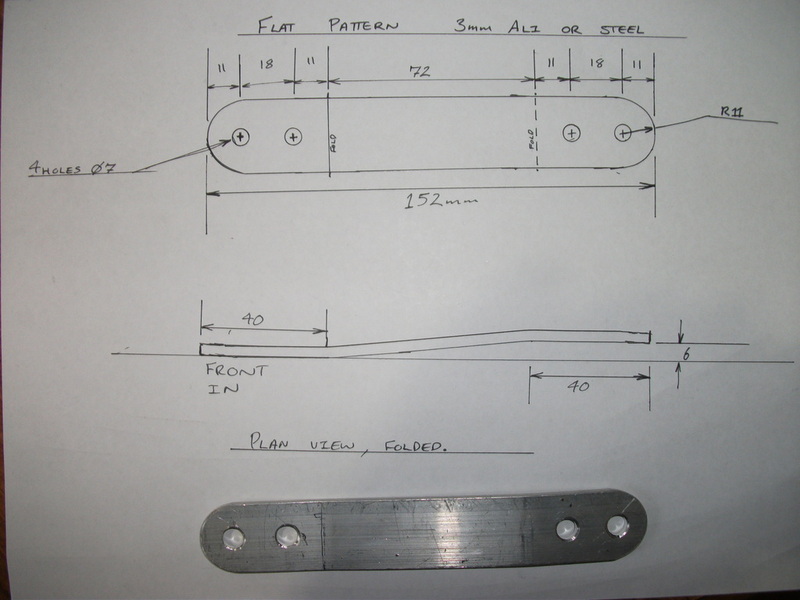 Plan view showing spacing to allow machining. I measured my rad mounts up, fabricated them out of 3mm aluminium, using a bandsaw, drill press, belt linisher and bar bender. Actually made two sets, a 12mm set and an 18mm set. the 12mm set doesn't fit at all, no clearance to get the bolts in. I think that the 12mm wouldn't have had the steering clearance even if it did fit. The 18mm seems to give about 5mm of clearance to the top radiator hose. Last edited by Kieran; 10-05-2015 at 01:38 AM. mikstr: Thank you... nice to know my spacer measurements are the same as your setup that works. I'd have been worried if they were very different. Whats the disk spacing on the CBR600rr brakes? What years? and what size disks are they set up for? Last edited by Kieran; 10-05-2015 at 03:27 AM. Your Rad hangers are pretty. Good idea to make them nice since (as I discovered) they really are visible even with everything assembled. 600RR rotor spacing is same as stock VTR wheel. 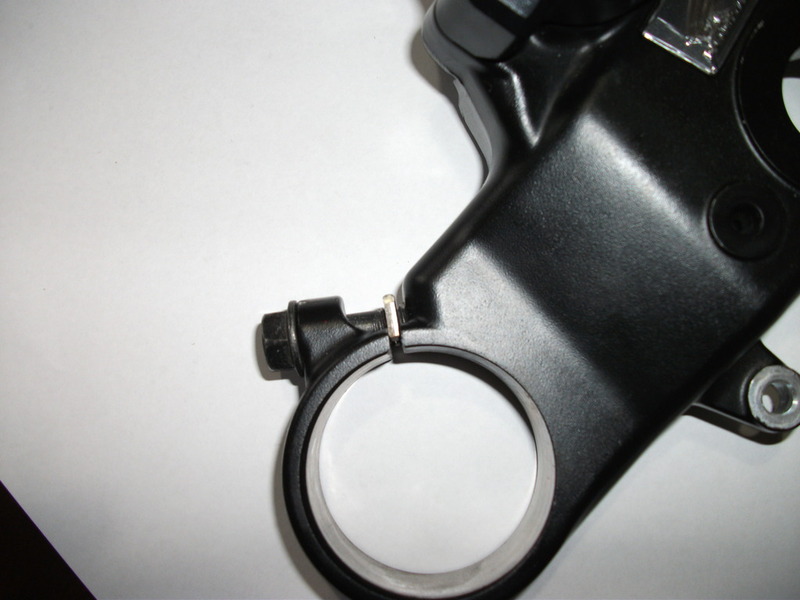 as for the Nissin calipers (they are the 4 pad units), they were on the ZX6R (2008-2012, were switched out for monoblocks in 2013). 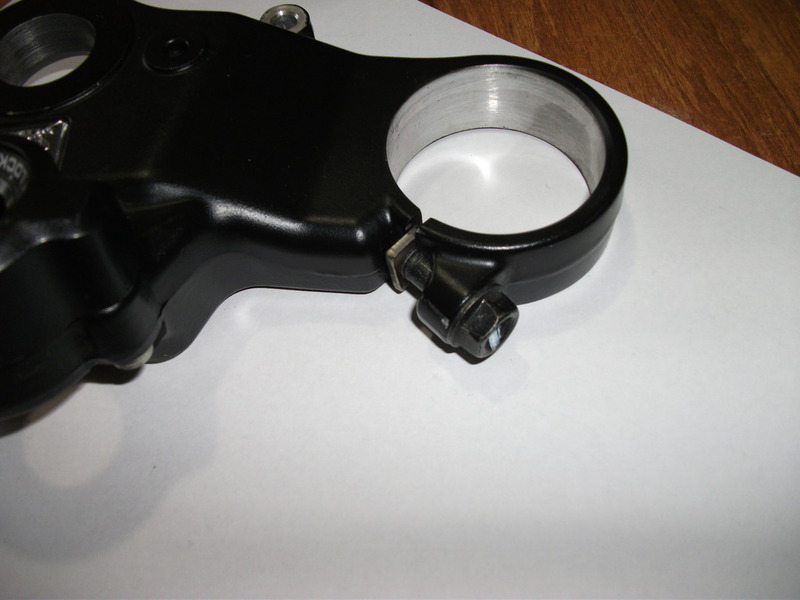 They are supposed to be a direct swap for 04-05 ZX10r calipers, so rotor size used was/is irrelevant. I think I'll run the tokico's until I change wheels, then go to the Nissins. Means I won't have to find funny sized caliper spacers. Got my bits back from the machine shop. Calipers good, handlebars good, spacers...ahem. I gave them the originals as samples for diameter. With drawings explaining what lengths I wanted. Oh well, we all have Mondays. That's with a capital M. I'll be back in there tomorrow. Let me know if you end up with a spare VTR front wheel. Im on the hunt for one. That's enough to make you feel like a pubic hair on a toilet seat, Pissed Off! 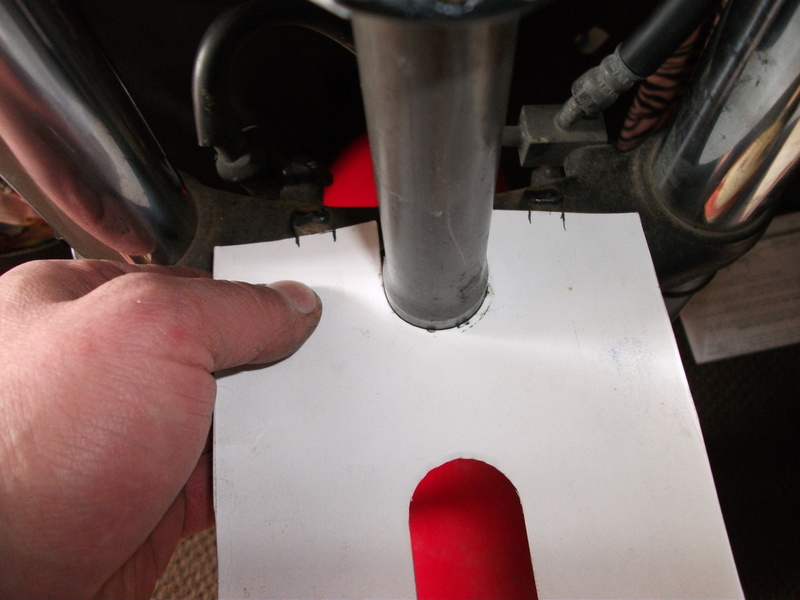 Let us know how you get on with the spacers. I have always liked the thought of a ZX10 front end. Will never get around to doing one because I am happy with my standard modded front end but, I must admit it is getting awfully light in the front now at speeds in excess of --- on open country roads out here down under! Took them back in, explained the problem. He got my original drawing out, took one look and said "Bugger". He's re-making them asap. Should get some pics of the other bits on this weekend.